When I first discovered Kate Spade, I’d moved from a very casual place (Santa Fe NM) to Washington, D.C. I had two little girls, and a new life, and no idea what to wear. I wasn’t the athleisure type. I didn’t want to run around in Lilly Pulitzer neon, or jeans, either. I was a stay-at-home mom transitioning to work in a conservatively-dressed city, and I had. No. Clue. Some people are indifferent to clothing styles. Some people are confident in their style. I was lost. Enter Kate Spade. Do you remember the original fragrance, a bombshell of gardenia, muguet and newly mown grass? I wasn’t into perfume then, but I loved that scent, and I wish I’d bought a dozen bottles on deep discount at Macy’s when they discontinued it. But it was Kate Spade’s clothes that really changed things for me. I’d never seen that kind of fashion with built-in whimsy that also managed to look fully adult and stylish. I didn’t have the money for a bunch of Kate Spade clothes and accessories, but I used the line (and Kate Spade herself) as an informal guide to putting together a similar, less expensive wardrobe for myself. I’ve always played with clothes – more costume, less career. I dove headfirst into the Santa Fe broomstick-skirt and cowboy boot look when we lived there. And I’ve always loved vintage clothes, especially the fit-and-flare styles that suited my girl-next-door looks. Kate Spade was a more office-friendly, pulled together and professional version of clothing that still catered to my love of costume. And it was fun, in a city that favors navy blue suits and flesh-colored pantyhose. Decades later I’m still wearing a pared-down version of that look. So Kate Spade’s death felt almost personal to me. You never really know what’s going on inside someone else’s head. And (as with Anthony Bourdain) a successful life from the outside can look so very, very bright and shiny, to the point that any indication otherwise comes as a terrible shock. I’ve had my own quiet bombshell the last few weeks (can a bombshell be quiet?) 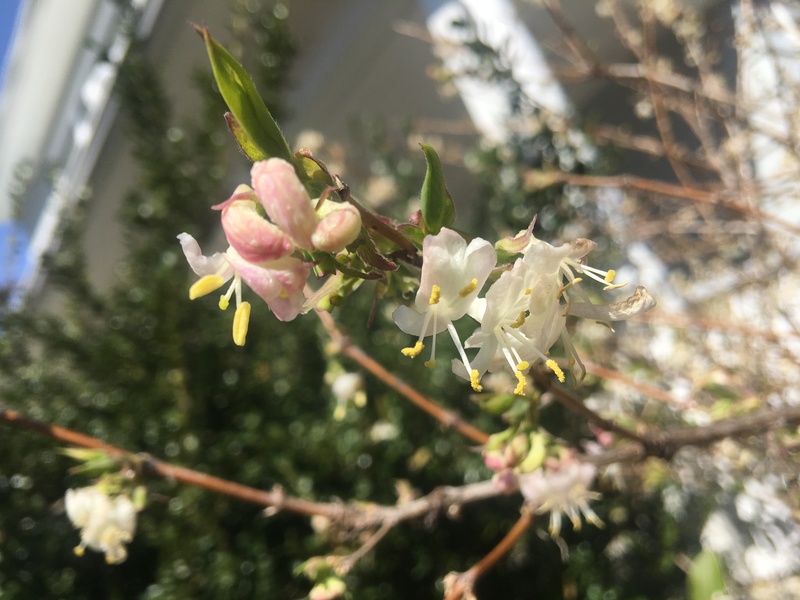 As my sense of smell returns slowly and unpredictably, with more recovered scent-memories and less meat-sweat phantom miasma stalking me, my beloved winter honeysuckle bloomed. It’s bloomed twice this winter, once in late January and a fuller, sweeter bloom now. I can smell it all the way across the yard. I mean, just look at that extravaganza! OK, I’m teasing. 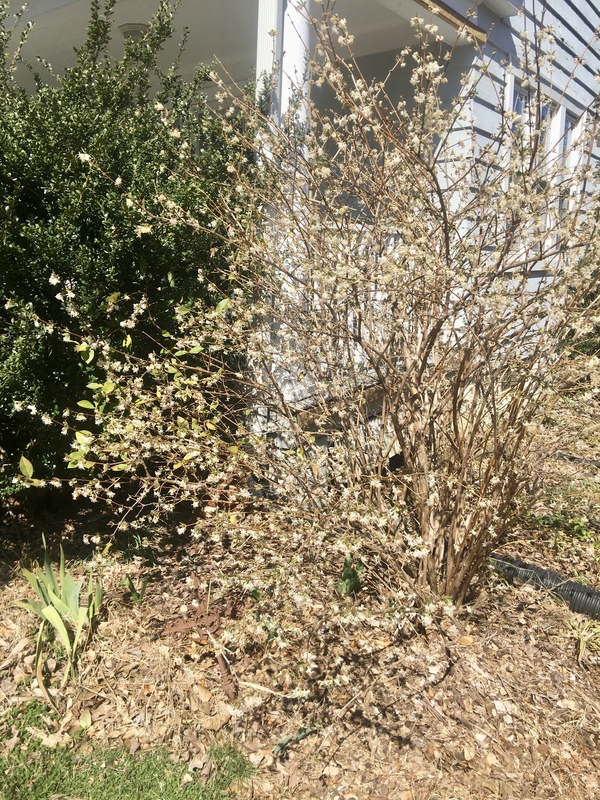 That bush looks like a whole lotta nothing even in the aggregate, because the blossoms are so small and pale and unassuming. But each tiny blossom is a powerhouse of fragrance. I’ve even got a few early spring bees wandering around on it, delirious. I didn’t think it was possible, but this year I appreciate the scent of those tiny, hopeful blossoms more than ever. I’m so happy to hear this news! Yay! And just in time for spring’s blooms. My husband can’t smell or taste at all, and it’s a real disability, one that people can’t see, but impacts his life in so many ways. Thank goodness you’re on the mend. I have a dab of the original Kate Spade left – I’m going to wear it tomorrow in honor of your honeysuckle smelling. Peace be with you! That original Kate Spade was great stuff. I wish I’d gotten a bottle, too. Not long after she died, my mom got me one of her handbags for my birthday. It’s somewhat large, shocking pink, and I get compliments on it all the time. Really glad your sense of smell is coming back. Honeysuckle is my favorite smell in the spring. I never took much notice of Kate Spade until she died. You’re not the first person I’ve known who felt she was a style icon and had a personal connection to her and her work. It seems she did for women in the 90s and naughties what Donna Karan did in the 70s & 80s. Gave them a fashion forward, wearable direction that fitted with a real life lifestyle. No wonder so many people fell under her spell. So happy to read your svellovision is coming back. YAY! Happy to hear your sense of smell is returning! Honeysuckle is so beautiful, enjoy every whiff! I missed out on the Kate Spade fragrances but I sure love her handbags and sunglasses. Darling! Congratulations on the Sniffer! I wore Kate Spade – omg, LOVED IT! I had the body crème (with the glitter) the body crème (without the glitter) the perfume. My SFA gal was SO sick of me buying it, she offered to buy me something – anything – else. Yes. To buy ME perfume! lol! Newp! I love her bags as well – I have a few of them (really, truly wished I’d gotten her grey with pink interior before it went the way of the Wodaabe. Alas. xoxoxo – and yes, you never can tell, can you? Money, fame, family – sometimes when it looks like Everything, it feels like Nothing. Alas. Wonderful news on the returning sense of smell. Must be a huge relief. Kate Spade’s death made me sad, and Anthony Bourdain’s even sadder. No, you never really know what’s going on in someone’s interior world. None of the big smelly bloomers are out here yet (honeysuckle, lilac) — maybe another month on lilac. I put a new yellow climbing rose in the ground which is coming along well. Looking forward to when that starts to bloom. So happy to hear that your sense of smell is returning! Yay! I love honeysuckle and just wore two honeysuckle scents this weekend. One weak one: Annick Goutal Chevrefeuille. It’s gone in sixty seconds on my skin. And one nice persistent one: Jeffrey Dame Honeysuckle. In fact, this one packs such a punch, that I went back and washed a bit off since I was going to be in close proximity to others. I got a compliment on it anyway. 🙂 I also have loved the bright primary colors of Kate Spade’s collections. So glad your sense of smell is returning! I have several Kate Spade notebooks because they are the cutest things ever! Hooray!! So, so happy your sniffer is on the mend! Best news I’ve seen all weekend! I, too, wish I had bought a ton of Kate Spade’s original fragrance — it sells for a king’s ransom on eBay (when you can find it)!! Loved her style as well and was so saddened when she died. I do have two of her bags: a chocolate brown doctor’s bag in faux Persian lamb, and also a black one, both with lime green satin interiors. Always get compliments when I use them in fall and winter. Loved her clothes, l was very sad to hear of her passing. Yay for spring in DC, blossoms everywhere and your sense of smell going in the right direction.